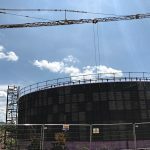 Our Self Erecting Tower Crane on a Bio Tank Project in Yeovil is soon coming to an end after almost four months on site. The Pedestrian Operated Tower Crane, a Potain IGO50 Self Erecting Crane, was placed on site in February to assist on the project over the following 16 weeks. It was placed on a full concrete raft base. 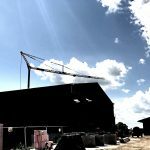 Our Mantis Cranes Operations Team arranged for a telehandler and qualified operator to assist with completing the erection. The Potain IGO is an extremely popular Self Erecting Tower Crane. This particular model provides a maximum lifting capacity of 1,000kg at the end of a 40m jib. Closer to the tower, and out to 13m, a maximum capacity lift of 4,000kg is possible. The Height Under Hook at the end of the jib is 23.2m. Is Pedestrian Operated Tower Crane hire possible in remote locations?